In order to evaluate whether or not the waterbody is meeting the state water quality standard, the PLSLWD monitors the streams and ditches within the watershed. This is done biweekly and sometimes more often for a very large rain event or special projects. Collecting samples at the desiltation pond. Flow and level monitoring is important in determining pollutant loads (i.e. pounds of phosphorus per year). Staff use a flow meter to measure how many cubic feet of water per second is moving through the stream channel at each site. A level logger is also located at every monitoring site and continually (every 15 minutes) logs the stream stage. With a reliable amount of flow measurements at various stream stages, staff can create a stage-discharge relationship which can be used to determine the volume of water going through the stream each year. By combining the volume of water and chemistry data, PLSLWD staff can calculate the pollutant load at each monitoring site. 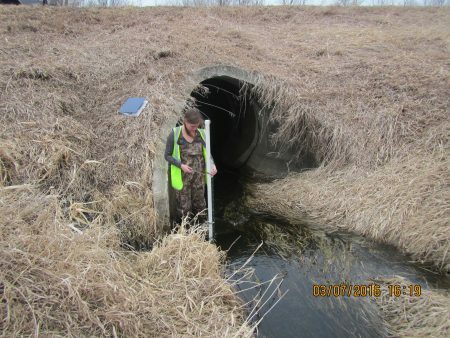 Installing the level logger at a stream monitoring site. The Ferric Chloride Treatment System is a special project that requires weekly sampling. In 1998, the PLSLWD constructed a ferric chloride (FeCl₃) treatment system to remove phosphorus out of stormwater from County Ditch 13, the main inflow to Spring Lake. The system was constructed as part of a Minnesota Pollution Control Agency (MPCA) Clean Water Partnership Implementation Project. In 2013, the District finished updating the Ferric Chloride Facility to meet new Minnesota Pollution Control Agency requirements, and increased the capacity of the system to treat water flowing through the area. Some of the key improvements to the system included upgrades to the line that adds the ferric chloride solution to the water and a bypass that will allow the system to continue to remove phosphorus in high flows. The weir at the Ferric Chloride facility, south of City Road 13 and downstream of City Ditch 13. Excess water, also known as runoff, from melting snow and rainwater in this area generally flows from the southwest to the northeast as it funnels through County Ditch 13 system toward Spring Lake. As this runoff flows through the Ferric Chloride system, the facility injects liquid ferric chloride into the water at a controlled rate in a desiltation pond. Here the ferric chloride attaches to the phosphorus in the water, then forms a solid material which falls to the bottom of the pond. This process ties up phosphorus before it continues to flow into Spring Lake. Removing phosphorus from the water before it reaches Spring Lake is important because Spring Lake already has too much phosphorus according to the federal Environmental Protection Agency (EPA) standards. Phosphorus is a nutrient that is important for animal and plant life in lake ecosystems, but too much phosphorus in the water can cause a chain reaction of undesirable events. If there is an excessive amount of phosphorus available in the water, it can promote harmful algal blooms that cause fish kills and interfere with swimming, fishing and boating. During operation in 2015, the system treated approximately 348 million gallons of water. The system reduced the average concentration of Total Phosphorus by 0.11 mg/L (48%) and removed a approximately 402 pounds. 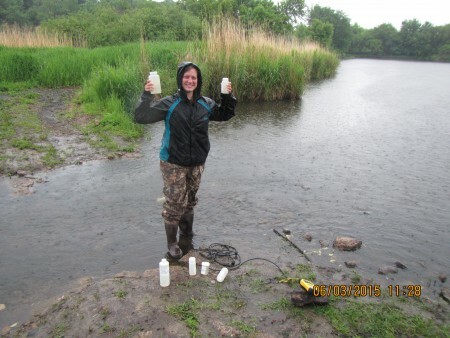 The concentration of dissolved phosphorus was reduced by an average of 0.027 mg/L (51%) and approximately 103 pounds were removed from the system. According to U of MN extension, just one pound of phosphorus can produce 500 pounds of algae! Monitoring reports for the ferric chloride system can be found on the Ferric Chloride system project page.